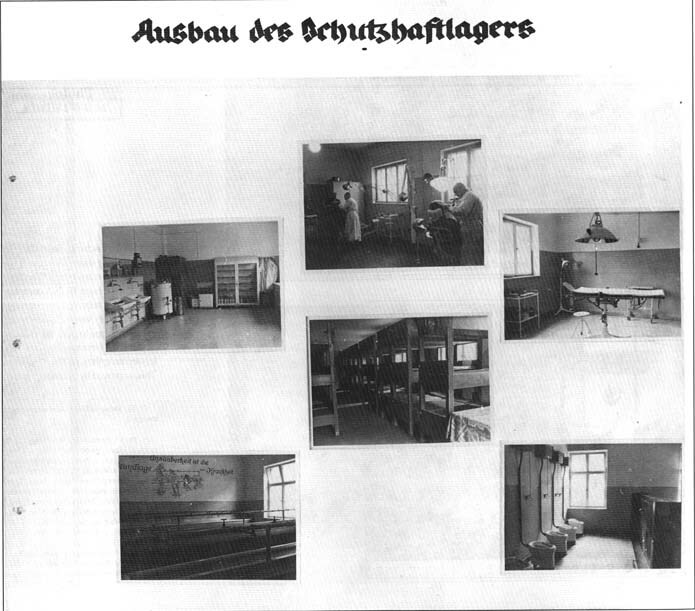 There are other equally idyllic “accounts” of the life of Auschwitz prisoners. For example, that of a “green” [common criminals Capo chosen at random. His clothes were of good quality: civilian trousers, zebra jacket made to measure by the camp tailors, “Mütze” [beret] the same. He wore good boots made to his size by the shoemakers. An exemplary “organization” of food supplies gave him 3000 to 4000 calories a day, keeping him in perfect form so that he was able to participate actively in the leisure activities of the camp. Concerts of light or military music, film shows in the Zentral Sauna or elsewhere, Sunday football matches organized on the Birkenau sports ground near Krematorium III, boxing matches at Monowitz, bathing in fine weather in the swimming pool at the main camp [Photos 8 to 12], where he had learned to swim, and lastly, on certain nights, to use up some of the spare energy that he had in abundance because of his light work. the brothel of Block 24 would open its welcoming doors to him. Well-qualified dentists filled the caries caused by the sweetmeats of Auschwitz. He even had an unsightly and bothersome cyst removed, the operation being carried out by a prisoner surgeon that he knew [Photo 7, upper, center and right hand photographs]. He left this favored place with regret in January 1945. After the war, in a weak and drained Germany, whenever he ran into one of the former SS guards of the camp they would exchange memories and he could not but hanker after the “good old days”. Questioned a few decades later by a historian about the Auschwitz gas chambers, he replied that he had indeed heard rumours on the subject, but he had never actually seen one himself. This story of a Capo living in clover is based on true and verifiable, facts, and is real to that extent. But there were very few Capos living like this, and their “luxury” food was taken from the rations of the average prisoner, who got only 800 to 1000 calories a day maximum, enough to keep him barely alive for three months. The “fashionable Capo” was not averse to asserting his authority by beating some of the starving sheep he was in charge of, just tor the pleasure and with perfect impunity.Some of the victims died, but so long as the bodies were there to be counted at roll call it did not matter. completion of the protective custody camp. Location: Stammlager / main camp.